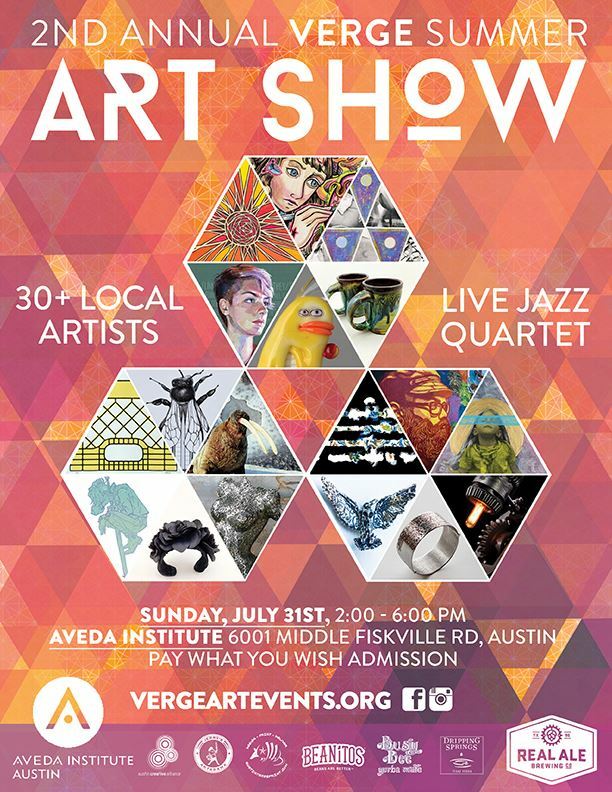 The 2nd Annual VERGE Summer Art Show will be Sunday, July 31st, 2:00pm- 6:00pm at the Aveda Institute, 6001 Middle Fiskville Rd, Austin, TX 78752. This multidisciplinary art and music event will showcase the talents of 25+ local artists, craftspeople and independent local publishers. Artists span all genres and media including, oil, acrylic, mixed media, watercolor, sculpture, woodworking, metalworking, jewelry, ceramics, photo realism, surrealism, abstract, illustration, street art, zines, poetry, fine art publications and more. Live music will be provided by Tommy Cornelision Group jazz quartet, with Tommy Cornelison on flute and guitar, Carl LoSchiavo on Bass, Brian Dunn on drums, and Ben Brajkovich on piano, with guest musician Sammy Epstein on clarinet and saxophone. Refreshments will be provided by Real Ale Brewing Company, Dripping Springs Vodka, Big Swell sparkling cocktails, Busy Bee Yerba Mate, and Beanitos. Admission is pay-as-you-wish, a portion of which will be donated to Aveda Institute’s fundraising efforts for The Breast Cancer Research Foundation. VERGE is a sponsored project of Austin Creative Alliance, and operates under ACA’s nonprofit status. VERGE’s goal is to supporting local artists and musicians by creating worthwhile opportunities to showcase their work.